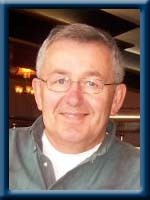 VEINOT – Richard E., 69, of Brooklyn, Queens County, passed away peacefully in Queens General Hospital, Liverpool on Monday, April 15th, 2013. Born in Liverpool, he was a son of the late Freeman and Hazel (Croft) Veinot. Richard worked in the printing business for most of his life and started and co-owned Veinot’s Print in Sandy Cove with his brother Ted. He was a member of the Lions Club for many years and held many offices including President and Secretary Treasurer. He was an avid golfer and was a member of the Liverpool Golf Club and a former member of the Liverpool Curling Club. He loved to play cards, especially crib, but most of all loved his family; the highlight of his life was his granddaughters. He is survived by his wife Eileen (Godwin), his daughter Kimberley (Irvin) MacKenzie of Brooklyn and his son Shawn (Missy) of Kentville. His granddaughters Kaylee and Kelsey MacKenzie, Paige, Brooke and Gabrielle Veinot. His sister Annabelle Rafuse of Milton and his brother Ted of Saint John, NB. so shocked to hear this sad news ,our deepest sympathy to all of you , love and hugs to you Eileen , Kim and Shawn , you are all in our thoughts as you go through this sad time . So shocked and saddened to hear of your loss. May precious memories help you through the diffiuclt times. Keeping you in thought and prayer. We were shocked when we heard about Richard. Our thoughts and our prayers are with your family. Eileen, I am so sorry to hear of Richards passing, my sincere sympathy to you and your family……he was blessed. Eileen and family, so sorry to hear of Richard’s passing Our thoughts are with you at this sad time. Lannie and Judy. I am so shocked and deeply saddened to hear of Richard’s passing. Please know that you are all in my thoughts and prayers at this most difficult time. God Bless. Deepest sympathy to you and the family. Dear Elieen and Family: Please accept our condolences at this most difficult time; our prayers and thoughts are with your family. We were shocked when we heard about Richard. Our thoughts and our prayers are with you & your family. We are so sorry about your sad news. Our deepest sympathy to all the family. Richard RIP. Sorry to hear of your loss. My sincere sympathy.May the thoughts and prayers of everyone help you through this tough time. We were so saddened to hear of Richard’s passing.Our thoughts and prayers are with you at this difficult time,remember all rhe good times and keep Richard close to your hearts.Our condolences to you all. I was floored when I heard the news. You couldn’t find a nicer man than Richard. He will be missed especially on the golf course and on the wharf during Haul up Days. Eileen and Kim, you have my deepest condolences! Eileen & Family: Our thoughts and Prayers are with you at this difficult time. Please accept my sincere condolences in your loss and may good times and fond memories help you get through the days ahead. Our deepest condolences to the family at this very sad time. Eileen and Family: We would like to express our sincere condolences to all of you at this sad time. We are both very sorry to hear about Richards passing. My deepest condolence to the family at this very time and God Bless you all. So shocked & sad to hear of Richards passing. Please accept our sincere condolences on the loss of your loved one, Richard. He was a great guy and always full of fun. Our thoughts and prayers are with you at this most difficult time. So shocked and sad to hear of Richards passing.Thinking of you all at this very difficult time. his friends and family. Take care and I will see you in the fall. Sorry for your loss, Our sincere sympathy to the family. To: Eileen and your family, We are so very sorry to hear of Richards’ passing. His cheery smile will be greatly missed, especially around the golf course. Our thoughts are with you. We were so saddened to hear of Richard’s passing, you are all in our thoughts and prayers, take care.. So very sorry to hear of Richards passing..he will truly be missed by all who knew him. You will be in our thoughts and prayers at this difficult time. May you find comfort in all the great memories. Sorry to hear of Richards passing sending our deepest sympathy our thoughs and prayers are with Eileen and family . Years ago, Richard and I played a lot of pool together at the legion. He will be sadly missed by Florence and myself. Eileen and Family…..I was shocked and saddened to hear of Richard’s passing. Richard was a great person. He always had a smile and knew how to make others smile. He will be missed by many. Thinking of you during this difficult time. We also were very shocked and saddened to hear about Richard. He was one of a kind. Sandy, David and BettyJean and I often would talk about our growing up with Richard living next door…fun memories. He will be missed by all who knew him. Sincere condolences for your loss. Our thoughts and prayers are with you and your family at this most difficult time. so full of fun and always a smile. He will be missed by all of his many friends. Please except our sincere condolences. Eileen,My condolences to you and your family at this difficult time. So sorry to hear about your loss! Take care! We are saddened to hear of Richard’s passing. We were saddened to hear of Richard’s death our hearts are with you at this difficult time. Eileen and family . What can i say ? I know the pain you are all suffering . I am still dealing with our loss . Richard was a lovely man . He always had a great smile . He will be so missed by his family and friends but he is now pain free. Our condolences . Brenda and Jim . Eileen & family,so saddened to hear of Richard’s passing.I enjoyed having a chat with him every couple of weeks when he came to my work to exchange bingo cards.He was a wonderful man & will be missed.In my thoughts & prayers. Eileen & family; it is with a heavy heart that I send you my deepest condolences …Richard will be fondly remembered by those of us who were lucky enough to have known him.He has left behind many precious memories. Sending our sincere sympathy to Eileen and famly; our thoughts and prayers are with you at this difficult time. We are so sorry to hear of Richard’s passing. Sending our deepest sympathy at this difficult time. We were so saddened to hear of Richard’s passing. He was a great cousin and nephew. He always had a smile and could always make you laugh. We always loved talking to Richard and he was always a pleasure to be around. Hold on to the wonderful memories that you have as they will help you through this difficult time. We will miss you Richard but now know that you will not suffer!! Oh to Eileen and family, we were like everyone else so sad and shocked to read of Richard’s passing. He sure was one of a kind and will be missed by ALL!! Please accept our sympathy and we know you will hold onto the memories. He was so much fun and had a great sense of humor, gone way too soon from his loved ones for sure. God Bless you all. Eileen & family – So sorry to hear of Richard’s passing. Please know that we are thinking of you all at this very difficult time. Sorry for your loss. A great guy!! So very sorry to hear of Richard’s passing.Take comfort in your many wonderful memories and the love and support of Family and Friends. So sorry Eileen & family to here of Richard’s passing, the smile with humor behind it will be missed but memories will always be with us. To Eileen and family, I am very sorry for your loss. To Eileen and Family. My condolences. Richard always had time for a smile to brighten your day. He will be missed. So sorry for your loss. Dear Eileen and family; sorry to hear of Richard’s passing. You will have many special memories that will always stay with you. Our thoughts are with you all at this difficult time. He will be well missed by many people. Eileen, Kim and families, Our deepest condolences to you and your families. You are in our thoughts and prayers during this difficult time. Very sad to learn of Richard’s passing. He was a great guy, He loved to laugh and make others laugh. He created many memorable times at bowling over the years and when I think of the antics he would go through it makes me smile. He will certainly be missed by many! My sincere condolences to the entire family. Eileen and family….so very sorry to hear of Richard’s passing. He was a great guy. I got to know him when I bowled with the Brooklyn league with Mom & Dad. He was a lot of fun. My thoughts and prayers are with you all. –We are so sorry to hear of Richard’s passing. Please know that we are thinking of you all at this very difficult time. Our thoughts are with you at this time. Richard will be missed by all and was a landmark in the community through Veinot’s Print. He will be missed by all. So very sorry to hear of Richard’s passing.Please accept our heartfelt condolences.Keep your wonderful memories close to your heart.May they bring you comfort in the days ahead. dear eileen so sorry to hear of richarda passing.i will always remember the time i spend at your home when i was a little girl and how good you and richard were to me.i will never forget you guys.if you need to talk just call me .,love fron cynthia roy . So sorry to hear of the passing of Richard, he was a great friend of mine for many years. Condolences to you and your family. Eileen and family — please accept our sincere condolences on your loss of Richard. We did not know him for a long time but long enough to know that he was a very good man with a big heart. Stay strong and love each other. We are lost for words, saddened & shocked to hear of Richard’s passing……what a wonderful man. We have so many wonderful memories, my favorite being Richard cooking Footlong Hotdogs at the family renunion 🙂 Please know that you are in our thoughts and prayers during this difficult time. He will be remembered by all. Richard was a wonderful man…hold on to the memories that live in your hearts. to you and all the family at this difficult time. I was so sorry to hear about Richard. Please pass our condolences along to all the family . So Sorry to hear of Richard’s passing Our thoughts are with you all at this sad time . Our condolences to you and your family at this difficult time. So sorry to hear of Richard’s passing. I tried to send you a private message but it looks like it did not go. I know what you are going through as I am still trying to deal with Joe’s death on January 19 of this year. Trust in God and know that you will see him again. That is all we can do and take comfort in at this time. Eileen and Family, We are so sorry for your loss. There are so many good things to be said of Richard but you all know them already. He will be missed by many. We cannot express how sorry we were to hear of Richard’s passing. Be strong and treasure the memories. Our thoughts and prayers are with you. So sorry to hear of the passing of your husband Richard. My thoughts and prayers are with you and yours at this time. Eileen and Family. We are so sorry to hear of Richard’s passing.He always took the time to come and see us when you came to Saint John to visit with family.Our thoughts and prayers are with you and your family. I am very sorry to hear of Richard’s passing. He was a very special person who always made me laugh at the golf course and any other place that I ran into him. My thoughts are with you – he was a great man. Our thoughts and prayers are with you and your family at this unexpected loss. May it comfort you and your family to know your cousins are thinking of you at this time. To the Veinot family: Sincere sympathy in the loss of your loved one. May God surround you with His peace. We are so sorry to hear of Richards passing. He was a great guy and friend. Our thoughts are with the families. Our thoughts and prayers are with you in this sad time. Richard was a very likeable guy. Sherman got to know Richard well as they both served various offices of the Lions Club. We have known Richard and you for a very long time and we are deeply saddened by this passing. Eileen, Kim, Shawn and family. We were so sorry to hear about Richards passing. He was a very kind and pleasant man and will be missed very much by everyone that knew him. Our thoughts and prayers will be with you at this difficult time. So very sorry to hear of Richard’s passing. Our thoughts are with you. I am very sorry to hear of Richard’s sudden passing. Richard and I were friends since we were 12 years old and next door neighbours as school boys. Richard never forgot his friends and always willing to help in anything he was involved in. He will be missed by his family and many, many friends. Our hearts are thinking of Eileen, Shawn and Kim and their families. We have lost a great person and friend. Eileen , so sorry to hear of Richards passing. Our thoughts and prayers are with you and your family. So very sorry to hear of your husband’s passing. Thinking of you, and sending my love at this sad time, and wishing I could reach out and give you a big hug. My heartfelt condolences go out to you and your family and may you find strength in knowing so many people care. I am so sad of your loss. I knew Richard many years and wherever he was there always was laughter,a wonderful man and friend. mansions ;if it were not so, I would have told you. Eileen & Family was so sorry to hear about Richard passing,he was a very thoughtful person and most days had a beautiful smile…he will be missed by many..remember all you good times together.thinking of you all at this time. Eileen & family, we were so sorry to hear the news about Richard. I don’t think I ever saw him that he didn’t have a smile on his face. Sending our thought and prayers to all of you. Eilene and family ,We are so sorry for the loss of your loving husband and father Richard. He was always so joyful and full of fun.Even though we were first cousins we didn’t see much of him we think we have all the time in the world but things can change so quickly. Please know that we are thinking of you all and you are in our prayers.God Bless. Please accept our condolences, Richard was a good friend and will be sadly missed by all. Our thoughts and prayers will be with you and your family. A wonderful sense of humour, fun to be around at all times. Richard will be missed by family and so many friends. Eilene and family,we are very sorry to hear of Richard’s sudden passing. We had many a good laugh during our younger years, when Richard worked at the Advance . You are in our thoughts and prayers. Our thoughts are with you at this time of sorrow. May you find comfort in the many happy memories you and your family have of Richard. He was loved and respected by many. So sorry to hear of Richards passing. He was well liked and did much work for his community . Sending our condolences on the loss of a wonderful husband,father and grandfather. I know you will all miss him greatly.His granddaughters were his world. Keep your memories close and know that you are never alone. Thinking of you at this most difficult time. Richard was one of a kind with a huge smile and sunny personality. To the Veimot Family,so sorry for your loss,cherish the memories you have and we all remember what a good person Richard was and how he loved his family and his community,our thoughts are with you at this difficult time. We are thinking of you all at this most difficult time. Take comfort in all your memories and happy times you shared. Kim and family. So sorry to hear of Richard’s passing, you are all in our thoughts and prayers. So sorry to hear of your loss. My thoughts and prayers are with you during this difficult time. Our thought and are with you at this difficult time. All our thoughts and prayers are with you at this sad time. May all the good times soon flood your memories as the sad ones disappear . Eileen,my deepest sympathy goes out to you and your family. I was so sorry to hear from Margie of your loss.I sent you a private message as it’s been such a long time since we’ve had contact.Sincerely Elaine. So sorry to hear of Richard’s passing. May the concern and sympathy of those who care help you through this difficult time. Sincere condolences to you and your family at this difficult time. Our thoughts are with you. I’m so very sorry to hear about Richard’s passing. Sending condolences to you and the family.